Canadian novelist and Esquire columnist Stephen Marche earned his Ph.D. with a dissertation on Shakespeare because he believed Shakespeare -- whose works encompass "the great globe itself" of high and low culture, to use the Bard's phrase -- would never bore him. 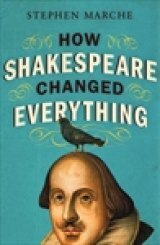 The author of "How Shakespeare Changed Everything" (Harper, an imprint of HarperCollins 224 pages, notes, $21.99, also available as an e-book) delivers a book for the general reader that even an English major like me can appreciate -- and there's not a drop of boredom in this little book. A requirement of my major was a semester of Shakespeare and we covered a lot of the Bard in that course more than 50 years ago, but I learned plenty from reading Marche's handy little book. It's 5.25 X 7.50 inches in size, while most of the review copies I receive have dimensions of 6.50 X 9.25 or so inches, so it's a very handy size for slipping into a jacket pocket or purse and dip into just about anywhere. * Shakespeare coined more than 1,700 words, including hobnob, glow, lackluster, and dawn. * Paul Robeson's 1943 performance as Othello on Broadway was a seminal moment in black history. * Tolstoy wrote an entire book about Shakespeare's failures as a writer. * In 1936, the Nazi Party tried to claim Shakespeare as a Germanic writer. * Without Shakespeare, the book titles Infinite Jest, The Sound and the Fury, Pale Fire, The Great Globe Itself (by diplomat William C. Bullitt) and Brave New World wouldn't exist. The popular woman's name Jessica is a Shakespeare gift (she's Shylock's daughter in "The Merchant of Venice") and starlings wouldn't be such an urban nuisance if a Shakespeare fanatic named Eugene Schlieffelin hadn't decided in 1890 to import 60 starlings from Europe to New York's Central Park because the Bard mentioned the bird in one of his plays: the importer, a pharmaceutical manufacturer, wanted all the birds mentioned by Shakespeare to be present in the U.S.! The hardy birds number in the hundreds of millions, range from the Gulf of Mexico to the Arctic Circle and are a boon to car washes everywhere. For a handy list of phrases introduced by Shakespeare, consult the list compiled by British journalist Bernard Levin and reproduced in part on pages 26, 27 and 28 in Marche's book. If you say "it's Greek to me," you're quoting the Bard. If you're "hoodwinked," ditto. Also: "tongue-tied, high time, bag and baggage, tower of strength, a laughing stock, the devil incarnate" and so on and so on. One of Marche's jobs after earning his doctorate was teaching English at The City College of New York in Harlem, a job he loved both because of the students and the neighborhood. Teaching Shakespeare in Harlem convinced Marche that Shakespeare was racist "so racist, I thought that certain plays shouldn't be taught at the high school level." Two of them are "Othello" and "The Merchant of Venice" because of their attitudes toward blacks and Jews, respectively. He expands on this theme with essays on the performances of both plays around the world, including "The Merchant of Venice" in a Jewish theatre in pre-Israel Palestine in 1936 and its performances -- and subsequent protests -- in Israel. Both essays are worth reading -- as are all the essays -- and I again stress that this book is primarily for the general reader, not the Shakespeare specialist. I particularly enjoyed the dialogue between two giants of Russian literature -- Anton Chekhov and Leo Tolstoy -- differed on the greatness of Shakespeare, with Chekhov admiring the Bard's genius and Tolstoy dismissing him as mediocre. Needless to say, I'm with Chekhov on this argument. "How Shakespeare Changed Everything" brings together mall food courts, Justin Bieber, Leonardo DiCaprio, Sigmund Freud, Victorian English painters and photographers and just about everybody influenced in one way or another by Shakespeare, "the most influential person who ever lived" in Marche's perhaps overheated phrase. You do look, my son, in a moved sort, / As if you were dismay'd: be cheerful, sir. / Our revels now are ended. These our actors, / As I foretold you, were all spirits and / Are melted into air, into thin air: / And, like the baseless fabric of this vision, / The cloud-capp'd towers, the gorgeous palaces, / The solemn temples, the great globe itself, / Ye all which it inherit, shall dissolve / And, like this insubstantial pageant faded, / Leave not a rack behind. / We are such stuff / As dreams are made on, and our little life / Is rounded with a sleep. Sir, I am vex'd; / Bear with my weakness; my, brain is troubled: / Be not disturb'd with my infirmity: / If you be pleased, retire into my cell / And there repose: a turn or two I'll walk, / To still my beating mind. Stephen Marche is the author of author of Shining at the Bottom of the Sea (2007) and Raymond and Hannah (2005). 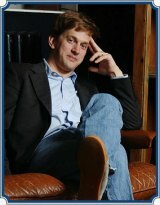 He currently writes "A Thousand Words About Our Culture," a monthly column for Esquire magazine, which in 2011 was a finalist for the ASME National Magazine Award for Commentary, in addition to opinion pieces for The New York Times, The Wall Street Journal, The New Republic, Salon.com, The Globe and Mail and The Toronto Star. He received a doctorate in Early Modern Drama in 2005 from the University of Toronto. His website is www.StephenMarche.com. Publisher's website: www.harpercollins.com.